Best Binoculars Under 300, $400 and $450 – 7 Top Picks of '18! Best Binoculars Under 300, $400 and $450 – 7 Top Picks of ’19! If you are looking for the best binoculars under 300, 400 or 450 USD range then you are in the right place. keep reading to discover our top notch pick! Optics technology has grown by leaps and bounds in recent years. Not long ago, a pair of top-quality hunting or birding binoculars would have cost you upwards of $1,000 or more. Today, however, you can pick up a solid pair for a fraction of that. The best binoculars under 400 bucks may be a little heavier and less maneuverable. However, there are a handful of less expensive binoculars capable of giving the top-dollar models a run for their money in virtually every other category. That being said, the key to finding a great value and an excellent set of binoculars in this price range is research, research, and more research. Lucky for you, I’ve already done all of the hard work by testing over 40 different models in order to find the very best binoculars under 300 and 400 your hard-earned money can buy. Enjoy! ​Chech if you are planning more less expensive bino such as under 100 then read the review from =>> here. What type or size of binoculars is best for me? When searching for the best binoculars under $300 or $400, it’s important to understand you get what you pay for. You wouldn’t expect an inexpensive disposable camera to get the same results as a professional 35mm camera, so you should expect to find a few differences between $300 binos and more expensive models. Durability – With binoculars in this price range, or any for that matter, build quality is an important factor to consider. Ultimately, you want rugged and durable binoculars designed to withstand the elements and years of abuse. The Twilight Factor – When shopping for optics, especially the best binoculars for hunting under 300, you want to find a set capable of gathering as much light as possible. This will provide you with a bright, clear image during the twilight hours and other low light situations. Now that you know what to look for when shopping for the best binoculars under $400 or $300 or $450 how about we make it really simple and dive right into the absolute best binos in these price ranges? Sound good? Alright, let’s go! Vanguard Sporting Optics has developed a strong reputation for producing high-quality binoculars and scopes at affordable prices. The Endeavor ED is no different. This nicely equipped mid-range binocular​ binocular first-class prisms, premium coatings, and as the name suggests, it even comes with ED glass. What really sets the Endeavor ED apart, however, is the use of both Emerald and V-Max silver coatings, which improve light reflection and the clarity of green objects like leaves. This makes them perfect for hunters and nature lovers like me who often find themselves in densely wooded environments. If you’re looking for a compact and lightweight binocular that looks great and produces super high-quality images, the Carson 3D Series High Definition Waterproof Binocular has your name all over it. Thanks to its use of top-quality glass elements, prisms, and coatings, images appear crisp and clear in low light conditions. That being said, what I really love about these binos is their compact, easy-to-use design. The guys at Carson even include a harness and a neck strap with every purchase, so you’re ready to go right out of the gate. Similar to the Endeavor ED in many ways, the Vanguard Spirit ED is a step down in price yet still delivers solid optical performance. It lacks the Emerald and Silver coatings, but the lenses are multi-coated nonetheless and provide surprisingly bright and clear images for the price point. The Spirit ED is also lighter and more compact than the Endeavor ED, making the binoculars an appealing option for anyone interested in simplicity and ease of use. The popularity of a product says a lot about its quality, so I just had to include the Bushnell legend Ultra HDs on this list! With hundreds of positive reviews from hunters and outdoorsmen, these binoculars are one of the most popular on the market today. Like the Endeavor and Spirit EDs, they feature ED glass for excellent resolution and color accuracy. However, the Legend Ultra HD binos also have RainGuard HD and wide-band coatings to repel water and minimize reflection. With a comfortable padded neck strap, premium microfiber case, and super affordable price tag as well, it’s easy to see why more people choose these Bushnell binoculars than almost any other when searching for the best binoculars under 300 bucks. Read more about Bushnell Legend Ultra HD 10×42 Binoculars Review ! If you’re willing to push your budget up a notch, Nikon’s Monarch 7 is a definite winner. Hunters rave about the Monarch’s top of the line optics and indestructible yet lightweight design. In other words, these binos simply deliver the goods. For a mid-range binocular sporting the trusted Nikon badge, it’s a steal at its current price point. The Celestron 71370 8x42 Granite Binoculars may be pushing the limits of the under $300 price range, but these under-rated binos deliver razor sharp images with absolutely zero chromatic aberration. This alone more than justifies an even higher price tag. What I really love about the Celestron Granite Binocular, however, is its open frame design, which provides excellent grip and maneuverability. As an avid hunter and outdoorsman who carries a lot of gear and often finds myself in awkward situations out in the wild, I truly appreciate the ingenuity of these Celestrons. The Zeiss Terra ED Binoculars are a fine example of German craftsmanship and exude quality in every way. From their SCHOTT ED glass lenses and unique hydrophobic multi-layer coatings to their large focus wheels and fiberglass-reinforced casings, every aspect of these Zeiss binoculars simply screams quality. I must admit, I am relatively new to the Zeiss brand, but after testing these out for a few days on the trail, Zeiss has definitely added another fan to their growing customer base. These models are by far the best binoculars under 400 bucks, but there are still some pretty solid options available for under $200﻿﻿ as well ; Read more about best binoculars under 200 . Keep in mind, however, you get what you pay for, and cheaper binoculars are often mass produced and poorly built. 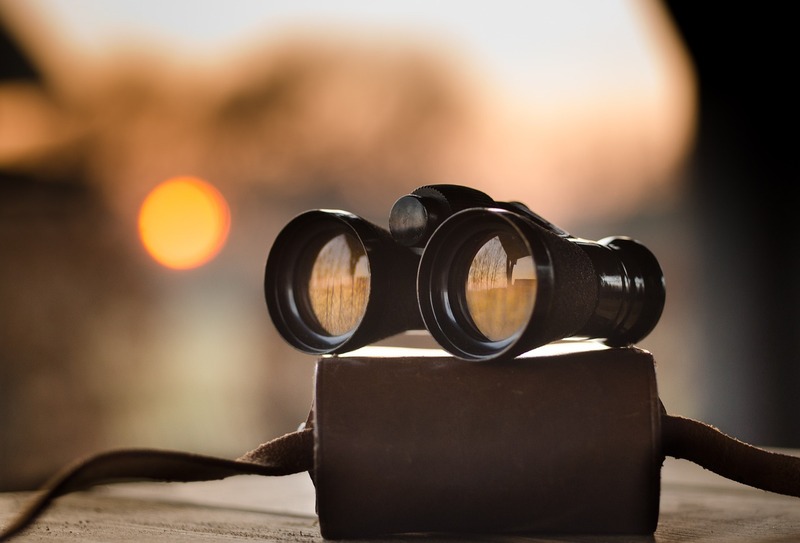 You can’t go wrong with any of the binoculars above, but you should re-read the beginning of this article to learn more about the important features of binoculars and your specific needs before pulling the trigger on a purchase. When you’re ready, take your pick from these awesome options and get ready to hit the trail!